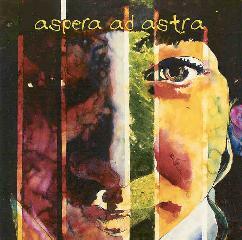 Aspera Ad Astra - "Peace"
A quartet from Philadelphia, Aspera Ad Astra delivers that thick, dreamy space that is usually associated with the midlands of England. This recording, apparently their debut, was made at the Asteroid #4's Deep Space Studio and not surprisingly, the two bands share some common ground. The liner notes for Peace aren't particularly informative, but the four (Matt, Mark, Justin, and Drew) obviously man the standard instrumentation (guitars, bass, and drums), along with some piano, various sound effects and sampled bits. The album sports eight tracks (plus an untitled bonus track stuck on at the end), mostly slowly-driven, deliberate tunes that work not to 'rock your boat' or anything, but rather to lull you into a state of contented indifference. The drummer, however, does his best to move things along, and this is evident right from the outset in the Bonham-esque intro to "Taking to Waking." In the end, the tune loses out to too much sappiness and mirrors the problem with too many hip alternative bands. Things improve dramatically with the next two tracks - "Sick 'n' Sad" jacks up the spaciness and features intertwining guitar lines; "Step into Me" on one hand drags in the mire, but then again features irresistible shimmer-guitar playing and a totally cosmic bridge section. A prime example of how music can sound both retro and uniquely modern. The thinly-delivered vocals call for you to "Set free your mind, and step into me." Yep, ok - can do. Following a couple less-inspired tracks of mostly piano noodlings, "Scannin' Lights" gets right back to the thick, interwoven drone guitars and a downright heavy chorus. The final credited track, "Take it Easy," is another dreamy piece that goes through more development, with spacey interludes amidst loud fuzz-guitar and more heavy-hitting percussion. Call it 'shoegazer' rock if you will, but Aspera Ad Astra succeed in creating cosmic soundscapes that are both musically interesting and accessible. And it's more challenging to make an album of laid-back tunes and make it work, while avoiding the temptation of covering up deficiencies in writing with misguided bravado and/or heavy sludge. Thankfully, they avoid these crutches, but I do get the feeling that they'd take a step forward if they just let their hair down once in a while and just let loose with reckless abandon.